Many anglophones new to Switzerland will have been struck by the high number of smokers. In fact the percentage of those who smoke is 68% higher than the United States. 28.2% of the Swiss population smoke, according to government figures for 2012. This compares to 19% of Brits and 16.8% of Americans. There are other big differences too, that make the contrast even more marked. Britain and the United States show big differences across socioeconomic groups. In Switzerland education seems to make little difference. 24.4% of those with a tertiary education smoke, compared to 27.3% of those with only high school education. In Britain only 14% of the managerial and professional class smoke, compared to 29% of those working in a routine or manual job. In the US only 7.9% of those with an undergraduate college degree smoke, with the percentage falling to 5.4% for those with a graduate degree. This compares to 21.7% of those with only a US high school diploma. If 100 Swiss graduates were to get together at a pub in Zurich with 100 American masters graduates, the 5 Americans outside smoking would be joined by 24 Swiss, a ratio of nearly five to one. Another more recent Swiss study shows an increased education related divergence for men. 24.7% of those with only a school education and 24.8% with apprenticeship training smoked while only 17.5% of those that had completed higher a professional qualification were smokers. The gender gap is greater in Switzerland too. 8.2% more men smoke than women – 32.4% of men and 24.2% of women. The difference in Britain is 5% – 22% of men and 17% of women. In the US the difference is also 5% – 18.4% of men and 14.8% of women smoke there. The small drop in Switzerland’s overall smoking rate also hides a big increase. From 1992 to 2012 the percentage of 15 to 24 year-old Swiss smoking shot up by 5.2% from 30.9 to 36.1%. Even more marked is the 6.7% increase from 25.7% to 32.4% for women within this same age band. Nearly every other age band saw a drop. Swiss residents have struggled to quit. In 1992, 30.1% of Swiss smoked. Over the 20 years to 2012 the percentage dropped a modest 1.9% to 28.2%. Britain and the US have seen their rates plummet over a similar period. In 1994, 25.5% of Americans smoked. By 2013 the percentage was 16.8%, a fall of 8.7%. Britain was similar. In 1993, 27% of British women smoked. By 2013 the figure was down by 10% to 17%. Similarly, large numbers of British men quit over the same period, reducing the their smoking rate by 6% from 28% to 22%. More recent figures from Monitorage suisse suggest more progress in Switzerland. Their numbers estimate that 24.9% of Switzerland’s population smoked in 2014, 3.3% below the 28.2% in 2012. The love affair with tobacco in not confined to Switzerland. A Eurobaromètre report shows high smoking rates in 2014 in all neighboring nations. Germany (27%), Italy (21%), Austria (26%) and France (32%) all had a lot of smokers. To breathe more freely while waiting for your train or bus, you’d need to move further afield to Sweden (10.7% in 2013) or Norway (13% in 2013). One area of convergence is when and why people start smoking. In Britain 66% of smokers start before the age of 18 and only 5% after the age of 25. Switzerland is similar. According to Monitorage suisse, 87% start before the age of 21. The reasons are the same too. School kids believe that people smoke because they think it makes them look cool in front of their friends (84% in a British survey said this) or their friends pressure them into it (70% in the same survey said this). Knowing a smoker dramatically increases the chance of taking it up. In the English study almost all smokers knew at least one person who smoked (97 per cent of regular smokers and 98 per cent of occasional smokers) compared with about half (51 per cent) of non-smokers. Once hooked smokers struggle to stop. 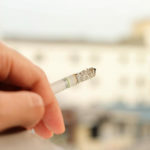 A Monitorage suisse survey in 2013, showed that 50.2% of Swiss smokers wanted to give up, however the percentage of people smoking daily only dropped by 1% that same year. A 2010 survey showed that 59% of those quitting had started again after 30 days. Passive smoking is a continuing problem too. 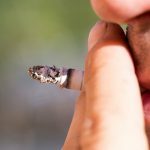 The rules banning smoking in Swiss public spaces in 2010 made a big difference, however in 2013 it was estimated that 35.1% of the population were still passively exposed to tobacco smoke for more than one hour a week. Most commonly, people were exposed to smoke in restaurants, cafés and bars (25.4%) and at friends’ places (24.7%). School and work (17.3%), and in the car (12.2%) were the next most likely places. In addition, 44.6% reported seeing smokers break smoking laws. 88.7% of those questioned were in favour of the 2010 ban, including 80.2% of daily smokers. Support was highest in Italian-speaking Switzerland where 99.7% were pleased about it. Unsurprisingly, Italian-speaking Switzerland has the highest smoking rates. The report does not mention difficult to avoid public spaces such as train station platforms or bus stops. Given these facts it is unsurprising that the Swiss government is working on plans to curb the sale and advertising of smokes to young people. Those opposing the new rules have managed to get them watered them down. Minors will still be able to sell tobacco products, something those pushing for tougher rules say makes it easier for young people to buy cigarettes. The other concession allows tobacco brands to continue sponsorship of some concerts and festivals, banned in the original plan. The Swiss Public Health Office estimates the health and societal cost of tobacco at CHF 5.6 billion annually. In 2015 the Swiss government launched a CHF 9.8 million smoke free campaign with the slogan: “Smoke free, I am stronger”. The campaign includes attention grabbing videos such as the ones below. Judging by the fewer than 1,000 clicks these two have received on YouTube, they don’t appear to have gone viral among 15 to 24 year-olds. Do you come from a country with low smoking rates? If so, what do you think is behind the lower rates and decline in smoker numbers? As almost every other comment stated, I was also schocked when I moved to Switzerland. Brazil has one of the lowest smoking rates in the world and I believe it was due to a constant government pressure. Advertising is almost completely forbidden (you will only see it in the cigarrettes’ stand), every cigarrette box contains a very explicit warning to smokers – visual and written. The smoking ban in closed areas has already many years, and now the government has forbidden it for every public space – you can only smoke inside your own house or car now. As Jane L said about New Zealand, in Brazil it is also socially unacceptable. I hope Switzerland will make the tough decisions to curb smoking and free everyone of this burden as in other countries. E-cigarettes have been a major cause for the recent fall in smoking in the UK. They really do help smokers quit. Surprising therefore that the Swiss have banned the sale of e-cig liquid containing nicotine. Our family moved from New Zealand to Geneva in 2013. I was utterly shocked when our daughter enrolled in College to find that the school day included planned smoking breaks for the children and an on-site designated smoking area. That encourages early addiction. NZ has had a 20+ year strategy to decrease smoking . The number of cigarettes available for consumption, a statistical measure that reflects sales, has generally been decreasing since they peaked at 6.3 billion in 1977 dropping to 2.4 billion cigarettes by 2008. Over the last 30 years the number of cigarettes that have been available has dropped by 61.5%. The NZ strategy includes education, help to quit and huge taxes on cigarettes. One pack of 20 cigarettes in NZ is 14.5chf. Every year tax is added and quit rates rise. The biggest difference between NZ and Switzerland though is that smoking is now socially unacceptable. in NZ I am rarely exposed to second-hand smoke unlike here where I am constantly walking through cigarette smoke in the street and walking over discarded butts. Getting smoking rates down takes time and a multi-pronged approach but it can (and must) be done. I think you need to check your math / editing skills for the statement in the first line (Switzerland has 68% more smokers than the US). I assume you meant 68% more smokers on a RELATIVE BASIS or as a percentage of the population. Given the population of Switzerland is only 8 million and the population of US is 320 million, your statement (as written) simply can’t be true and distracts from an otherwise interesting article. Sure wish it was illegal to smoke in train stations like it is in all the other European countries we visit. In rush hour, it can be impossible to avoid. Agreed. This is by far the worst exposure I experience currently. I despair at people lighting up as soon as their feet touch the platform when they get off. Underpasses connecting platforms should be smoke free zones, so too should platforms and station concourses. I am from Australia where we have strict laws regarding smoking. On a recent trip to Switzerland to visit family my husband and I were shocked at the number of smokers and found it difficult to find smoke free areas. We could not sit outside and enjoy the scenery along the river and lake but were closeted inside to get away from the smoke. Even up in the mountains the litter of cigarette butts blighted the area. It’s time Switzerland woke up to the health implications. When I moved to Switzerland in 2008 I was shocked at the number of people who smoked and that you could smoke in bars and cafés. I have since learned that the Swiss are just slow to adopt change. What happens elsewhere in the Western World happens years later in Switzerland. Just look at Universal suffrage.